Published: July 14, 2017 at 11:53 a.m.
Editor's note: NFL.com analyst Lance Zierlein will reveal the top CFB players to watch in 2017 at each position over the next two weeks, continuing today with offensive linemen. Of course, there is still plenty of work to be done in evaluating each player during and after this season. Of the offensive linemen I've studied, here are the top 10 to watch. Little was one of the top-rated prospects coming out of high school in 2015 and started four games as a freshman at Ole Miss last season. He's big and long, but this season he is 20 pounds lighter than last season (320 down from 340) which should help him improve with his quickness against edge rushers. Little was a bit overmatched at times last season, but it wasn't difficult to see the physical traits and potential that should help him make a huge jump this season, especially at his lighter weight. Smith is bumping outside to tackle this year. According to Auburn insiders I've spoken with, it is likely that guard will be his best position when it's all said and done. Smith has a chiseled, tapered frame that screams offensive tackle, but he might lack some of the necessary skill set to play outside. What he does have is plus power at the point of attack and very good contact balance to lock up and slug it out with the big boys across from him. Williams stepped into the starting lineup as a true freshman last season and looked like a multi-year starter from Day One. Williams will continue to get bigger and stronger and it isn't a stretch to think that he could be at the top of this list next season. He plays with an edge and was clearly unintimidated by the veteran SEC competition that lined up across from him last season. He's already a quality pass protector with plus hands and a solid kick-slide out to the edge. I would like to see him take better angles as a run blocker this season to get to his reach blocks more consistently. Two years ago, Willie Beavers was drafted off of the Western Michigan offensive line and last year it was Taylor Moton. This season, scouts have a watchful eye on this senior left tackle. Okorafor has the size and mass that will have evaluators drooling and he's already better in pass protection than Moton was, in my opinion. Okorafor has very strong hands, but needs to become more consistent with his hand placement and his overall pad level as a run blocker to take the next step this season. 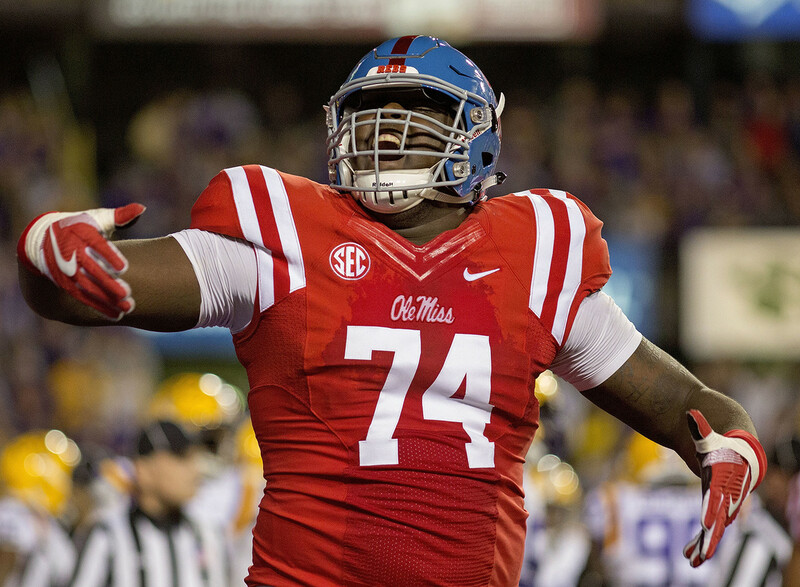 Price is considered a freakish athlete in NFL scouting circles and more than one personnel director told me that he will likely be the talk of the combine among offensive linemen. Price has elite power and an ability to get down the field when asked to play in space. Like Pat Elflein before him, Price will bump from the starting guard spot to center this season. Price's engine can run a little hot. He has to maintain his discipline and play under control. McGlinchey decided against entering the draft after last season, which was the right decision, in my opinion. McGlinchey needed additional weight-room work to prepare for the speed-to-power rushers he will see in the pros. As a prospect, he has the desired combination of size, length and athletic ability. He combines with Quenton Nelson to form one of the most lethal run-blocking tandems in college football. Unlike other tackles who need to work on core strength or anchor, McGlinchey isn't a leaner. He operates with a flat back and strong fundamentals in pass protection. He's a safe, steady tackle. There were times during my tape study of Adams where I was leaning toward making him my top offensive lineman on this list. He's long, extremely athletic and has better core strength than most prospects we see with his build. Adams possesses a stiff punch in pass protection and he might be as fluid a blocker in space as Broncos first-round pick Garett Bolles. My primary concern is his consistency as a finisher. He would have Alabama defenders seemingly blocked in the national semifinal game last season, and then they would come off of the block and get in on tackles. If he can shore that up and sustain blocks longer, he could become the top offensive lineman in college football. Brown's improvement on tape from his freshman to sophomore season was impressive. The first thing that stands out about the mammoth left tackle is his improved body control/balance. He seems to have grown into his huge frame with a comfort level we didn't see in his freshman campaign. Brown's long arms are always first to land on opponents and he was able to discombobulate their rush plans early in the snap with his inside hand, which acted as a stiff jab. He lacks desired quickness and knee bend, but his size and length might be enough to overcome those deficiencies. Watching Williams operate feels eerily similar to watching former Texas A&M tackle and Falcons first-rounder Jake Matthews when he was in college. Like Matthews, Williams was the best technician on the offensive line as soon as he took his first starting snap as a freshmen. Williams has outstanding body control and hand placement. His ability to mirror defenders and keep them in front of him is as good as you will find in college football. Williams uses foot quickness and smart angles to make challenging blocks in the running game and he stays connected to his blocks for as long as it takes. Williams' lack of arm length allows edge rushers to get to his frame first at times, so there is a chance he will be drafted as a guard or center, like Western Kentucky's Forrest Lamp. Nelson possesses a thick, burly frame, intimidating power and a burning desire to bury the man across from him. He has great size and exceptional potential as a run blocker. He's able to unlock his hips into contact and uproot defenders, creating massive running lanes. Nelson has been well-schooled by Notre Dame offensive line coach Harry Hiestand. The way he works with left tackle Mike McGlinchey on combo blocks and double teams is a sight to behold. There are times he will get out of position as a pass protector and he has had some injury issues in the past. However, his size, power, play demeanor and ability to dominate in the running game make him my top offensive lineman to watch heading into the season.